Now that some bookmakers are already paying out on bets that Jeremy Corbyn will win the Labour leadership, it is time to look at the also-rans, the bland non-entities currently sparring with each other for the dubious honour of a second place finish. And as a general rule, they have not covered themselves in glory. Yvette Cooper’s campaign has been notable not so much for her ideas (thoroughly unexciting, as befits her Guardian endorsement) but for her decision to weaponise the feminist angle in the desperate search for votes. Bringing back clause IV: spending billions of pounds we haven’t got switching control of some power stations from a group of white middle aged men in an energy company to a group of white middle aged men in Whitehall. Let’s be clear: Yvette Cooper doesn’t think that nationalisation is bad because it would lead to inefficiency, higher prices or less reliable service, or for any other ideological reason. Her only objection to Corbyn’s proposal is that “white, middle aged men” would continue to run the show. Presumably, by this logic, Cooper would be happy to turn over the nation’s power stations to any old consortium that happened to bid for them, regardless of their competence, just so long as they had 51% female representation at board level. When you’re thinking about the economy’s infrastructure, the things that underpin a strong economy, we’ve always traditionally talked about roads, railways, transport infrastructure, maybe skills, maybe training. I think we shouldn’t just talk about the trains and planes and the boys toys. Actually in a modern economy, it’s about childcare. The point here is not necessarily a bad one – social capital does matter just as much as physical infrastructure. But was the disdainful comment about boys and their toys really necessary? What did that add to the discussion? And since when are trains and aeroplanes “boys’ toys”? Since when have girls not been allowed to be aviation geeks or engineers? This is crude gender stereotyping at its worst – planes and trains are the preserve of immature men, according to Cooper, while wise girls and women care more about the intangible, softer, societal side of things. And I think sometimes you make a hard-headed choice when you’re a working mum. You make a hard-headed choice about what are the things you can do well, what are the things that you want to do. Do you get it? 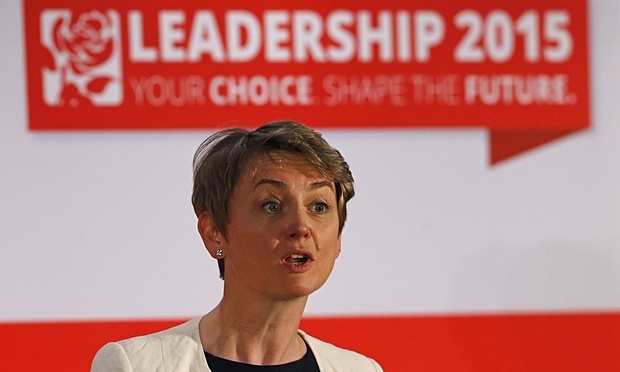 Yvette Cooper is a mum. She has given birth to children, and in doing so has acquired a heightened ability to prioritise and assess her own strengths which childless women (Liz Kendall), or men – in all their hopelessness – cannot possibly match. There was some suggestion awhile ago that somehow, you know, the women should stand aside and leave the pitch and leave it all to the boys, I certainly don’t think that we should do that. There was no such suggestion. There was a suggestion – one that this blog vehemently disagrees with – for the forces of centrism to collude among themselves and agree on a unity candidate to face off alone against Corbyn. But it had absolutely nothing to do with any conspiracy to force the women from the race. Cooper is creating the feeblest of straw man arguments here, one with no basis in fact whatsoever. There are not one-off occurrences, or soundbites taken out of context. They are deliberate acts, repeated time and again, by an experienced political operator who knows exactly what she is doing. The choice of words and the tone of the message is not accidental. But it is thoroughly depressing. Feminism as practised by Yvette Cooper doesn’t seek to empower women and strive for equality of opportunity – it contents itself with mocking and belittling men instead. In full accordance with the twisted left-wing ideology Cooper subscribes to as a New Labour machine politician, her style of feminism is more about tearing men down than building women up. This is a feminism that denigrates the accomplishment of Margaret Thatcher’s election as Prime Minister in 1979, but rejoices in the fact that the Equalities Act forces government departments to go through an exercise in box-checking to prove that any new policies give due consideration to their likely impact on women and other protected minorities. Cooper may have chosen to run as the feminist standard-bearer of this leadership election, but these cheap verbal tricks – and the cynical way in which she plays the sexes off against each other – hardly make her a great role model, let alone a latter day suffragette, as she implausibly claims to be. Labour leadership candidate Yvette Cooper has called a truce in her campaign’s spat with her rival Andy Burnham, but has made clear she will not tolerate “sexist” claims that her tactics are being driven by her husband and former shadow chancellor, Ed Balls. After tensions erupted between the campaigns on Monday, Cooper took issue with a source in Burnham’s campaign for suggesting that her tactics were “straight out of the Ed Balls playbook”. Actually, it’s all a bit more 1990. Yvette Cooper’s brand of finger-wagging feminism is every dumb commercial you have ever seen where the carefree, happy-go-lucky husband has to be scolded by the exasperated but loving wife for being inconsiderate and making a mess of the house. Rather than seeking to build women up and move past these lazy pastiches, Cooper plays up to just about every gender based stereotype going. In so doing, Cooper has frittered away the Labour leadership election, not arguing that British politics needs more women, but rather that it needs less stupid, obsessive men. If this counts as feminism, it’s a very poor manifestation indeed. And for this blatant attempt to weaponise the feminist cause in cynical search of political gain, it is hard to think of anyone less worthy of following in Margaret Thatcher’s trailblazing footsteps than Labour’s Yvette Cooper. Next Article What Are The Aims And Values Of The Labour Party?